In my event overview for the New Zealand Festival of Motor Racing, I briefly touched on what I considered to be the ultimate nostalgic manifestation of the Kiwi love affair for fast, lairy V8 race cars. This of course was the Sports Sedan era, a period through the 1970s until the mid-’80s where shed-built creations battled for tarmac superiority across the nation’s tracks. 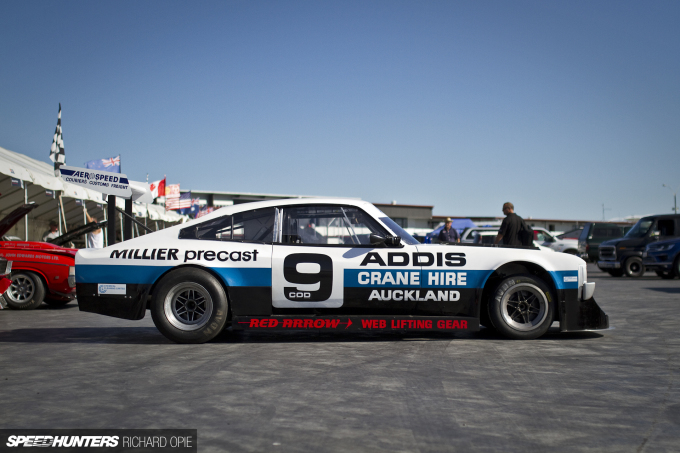 These cars truly were the bad-asses of New Zealand motorsport at the time. 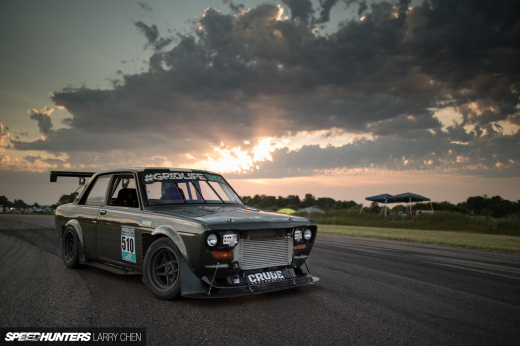 With a rulebook which could be described conservatively as ‘loose’, the category gave way to competition builds that harnessed the innovative and plain crazy, like no other class of the era. These were machines with limited constraints, pieced together by men in garages obsessed with shaving every last second off their lap times in the pursuit of other crazy, genius campaigners. Strolling the pits on the first Saturday of the NZFMR event, I had my eyes peeled for a car that best conveyed the New Zealand ‘number 8 wire’ mentality. That is, a bit of good old fashioned Kiwi ingenuity, mashed together with a selection of motley go-fast parts culminating in something that went damn fast. And I found exactly what I was looking for in Graeme Addis’ 1972 Chrysler Valiant Charger, a long-standing race machine with a current form far removed from the day it rolled off the factory floor. 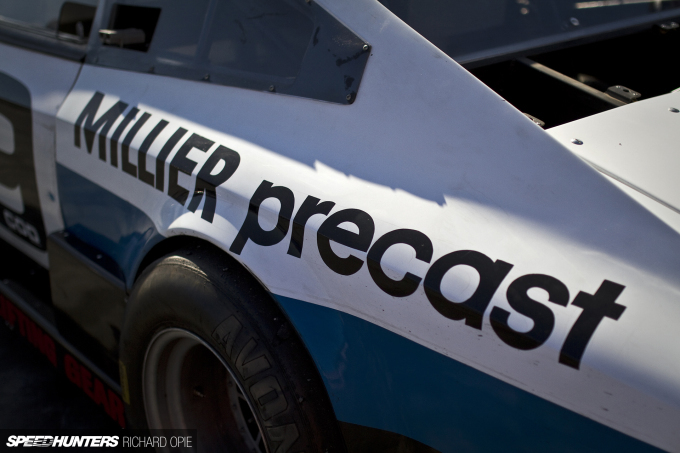 The Charger began life as a race car. Entered in the local production race series by the New Zealand distributor, Todd Motors, in 1972 it finished second in the prestigious Benson & Hedges endurance race . The following year it was acquired by Addis and then retired from competition in 1974. 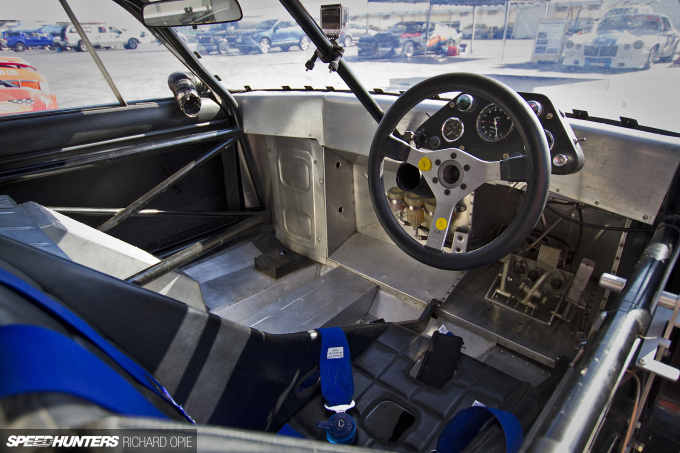 In 1976, the transformation from production racer to Sports Sedan began, and it wasn’t long before the car shed any road-going intentions whatsoever and took the form of a pure race machine. Function was prioritised over form; a perfect case in point being the spartan instrumentation perched atop the steering column. 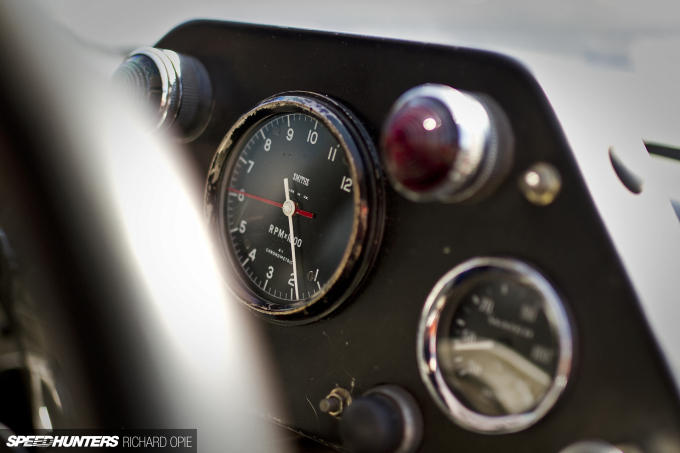 Like most features of old race cars, even the Smiths tachometer has a distinctively mechanical appeal to its visual. On the surface the Charger appears to retain some semblance of its original construction. 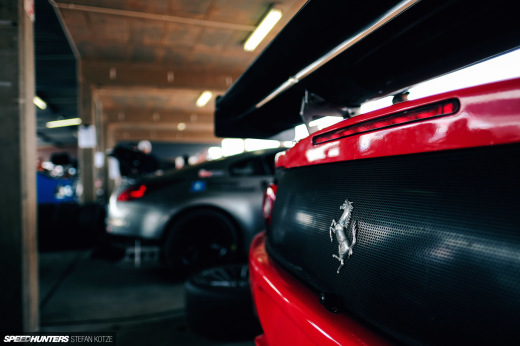 While the body may look akin to a standard car – albeit with an unusually extended wheelbase and a plethora of bulges and additions targeted towards performance – beneath the largely fibreglass exterior is a tubular space-frame that’s been carefully thought out and constructed. Details like the mismatched wheel size and huge Avon rear slicks start raising questions. And why the 6-stud wheels? That’s slightly unusual for a racing saloon, right? 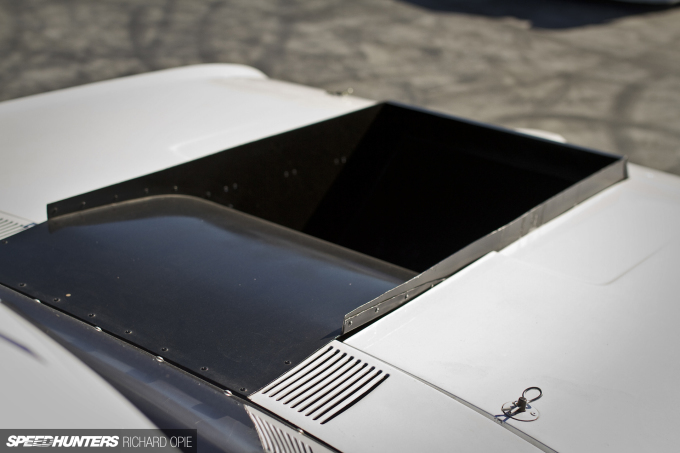 A peek under the rear, through the massive opening where the rear panel normally would be, answers these questions. 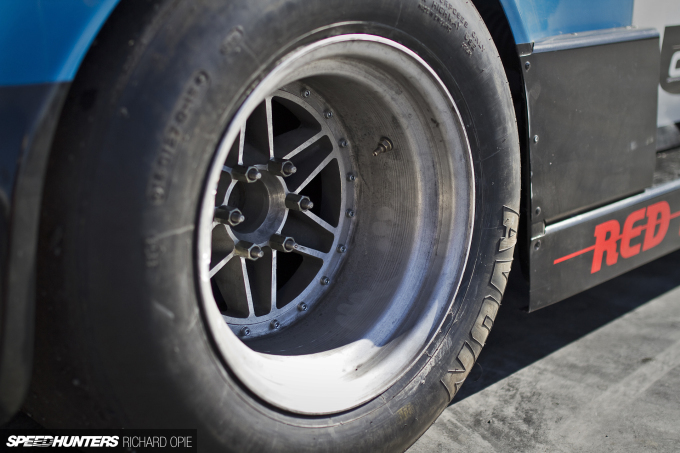 Graeme’s Charger, for all intents and purposes, is draped across a Lola T190 Formula 5000 open-wheeler. 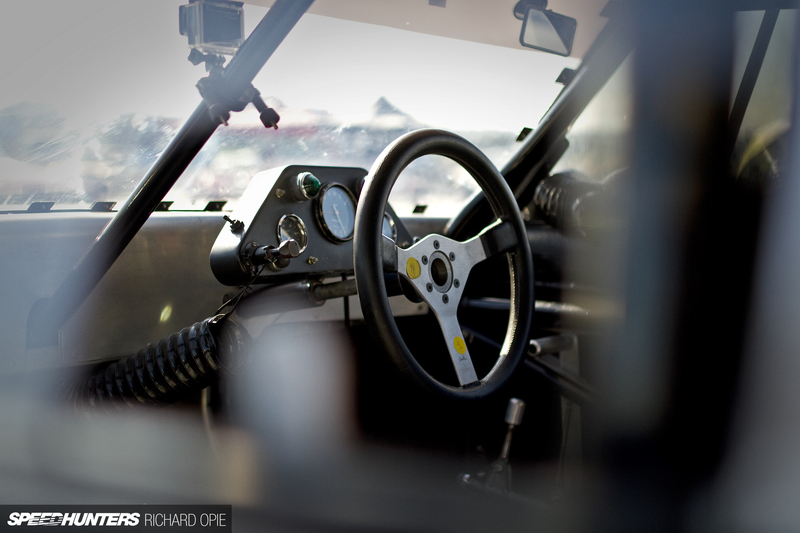 Taking pride of place in the rear is a Hewland transaxle, located by a custom cradle which utilises the Lola suspension components and uprights. 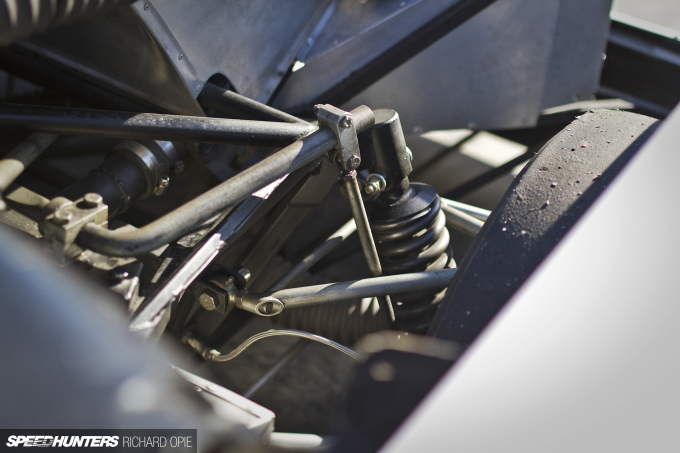 Up front it’s remarkably similar, the tube-frame chassis making use of the Lola uprights and suspension pick-ups. 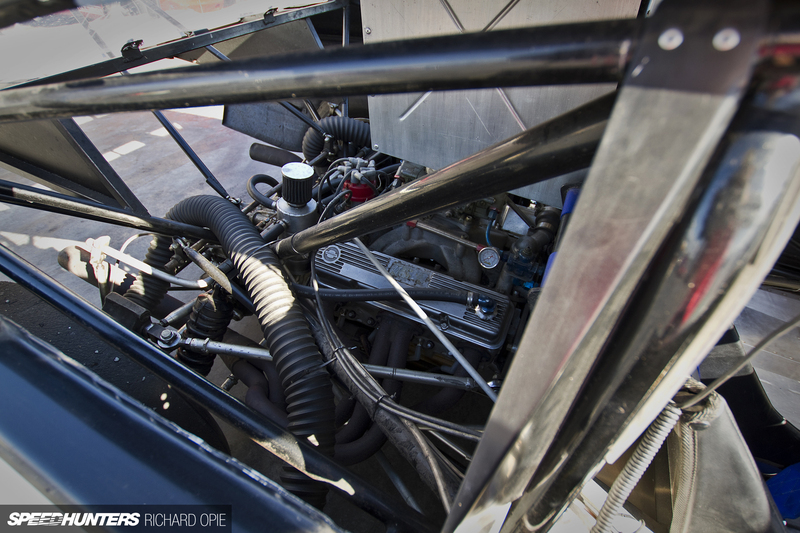 Bolted to the transaxle is a small-block Chevy V8. 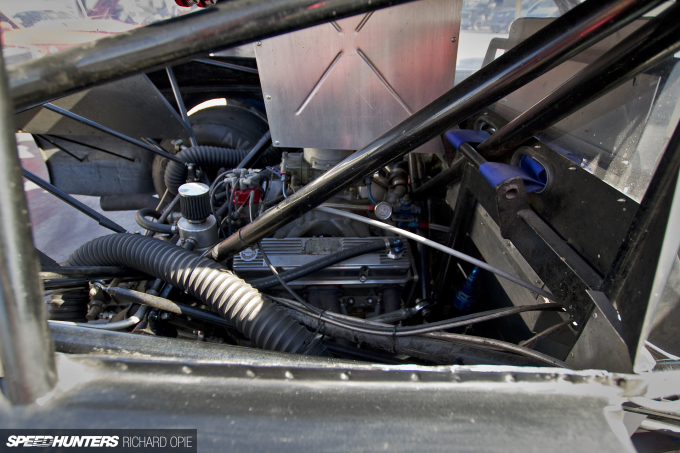 While the car originally ran with a Formula 5000 5-litre unit complete with period mechanical fuel injection, it eventually received a 6-litre unit fed by a large 4-barrel Holley carburettor. Graeme recalls the relocation of the engine to the centre of the vehicle behind the fabricated cabin firewall resulted in prodigious levels of rear grip, but the trade-off was vague front-end grip as well as some aerodynamic lift. More good old Kiwi ingenuity followed. 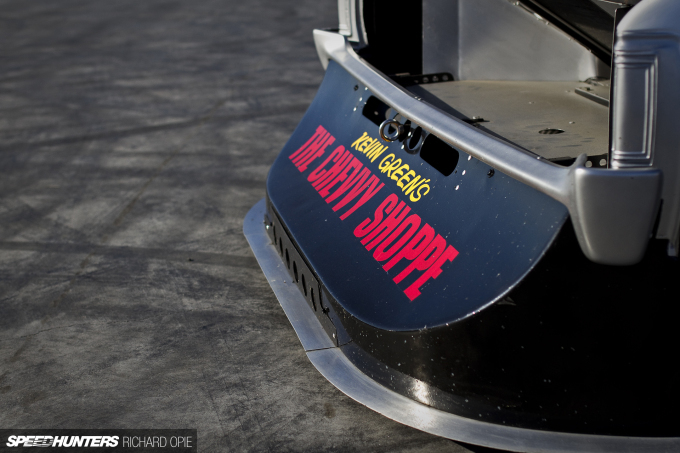 A self-developed aero package was added to the Charger, largely through studying images of how “the guys were doing it overseas.” Graeme engineered his own in-cabin adjustable rear wing, with the angle of attack able to be altered on the fly. Up the front, a substantial air-dam both directs cooling air through the front mounted radiator, but also enables control of air-flow beneath the car and under the flat floor; in essence an early take on ground effects technology. 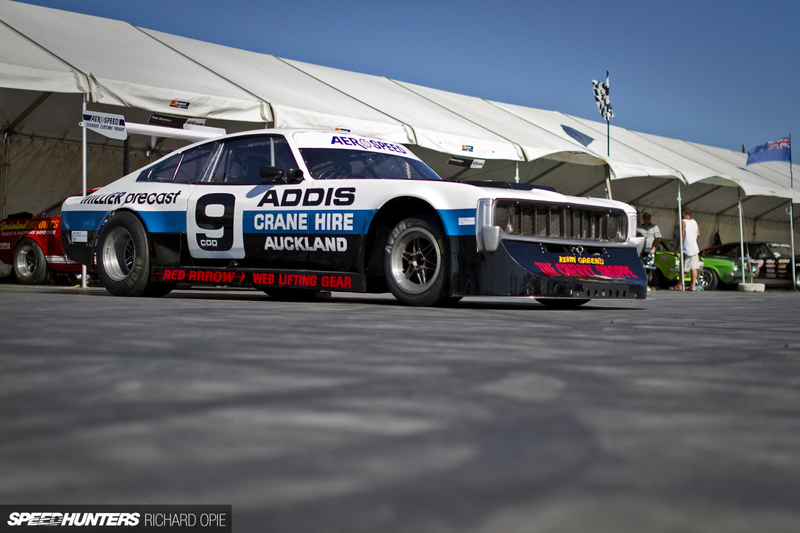 The story almost came to a close in the late 1980s when Motorsport New Zealand effectively outlawed the Charger (and many others like it) and changed the regulations almost overnight for the class. Fed up, Graeme pushed the car in an empty shipping container, welded the doors shut and dragged it to the bottom of his farm. Come 2012 and renewed interest in the Sports Sedans of past, the Charger was exhumed, the mechanicals checked over, and the original painted signwriting touched up (by the original signwriter no less!) in anticipation of its return. 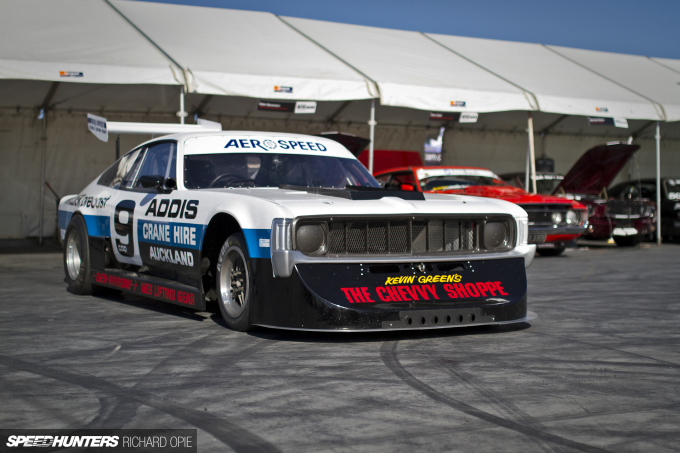 Nostalgic race enthusiasts welcomed Graeme and the Charger back on track with open arms too. Yet another chapter is beginning for this shining beacon of true Kiwi race ingenuity. Check out the extra chapter below for a bunch of bonus images and an old school interview with Graeme. Jesus Backpacking Christ you guys are nuts. Seeing this at a targa would be ...awesome. Ahh, the good old days eh. The thing that strikes me most about this car visually is possibly the most subtle, and probably the least significant - the reworking of the C-pillar. If only they'd come that way from factory, it was always my biggest bugbear with the shape. Ok wtf....a Lola chassis...I was not expecting that at all. This thing is amazing!! Love the 70's sport sedans, this Charger reminds me of John McCormack's Ansett/Elfin Charger that raced in Australia from 1974 to 1977 or so. 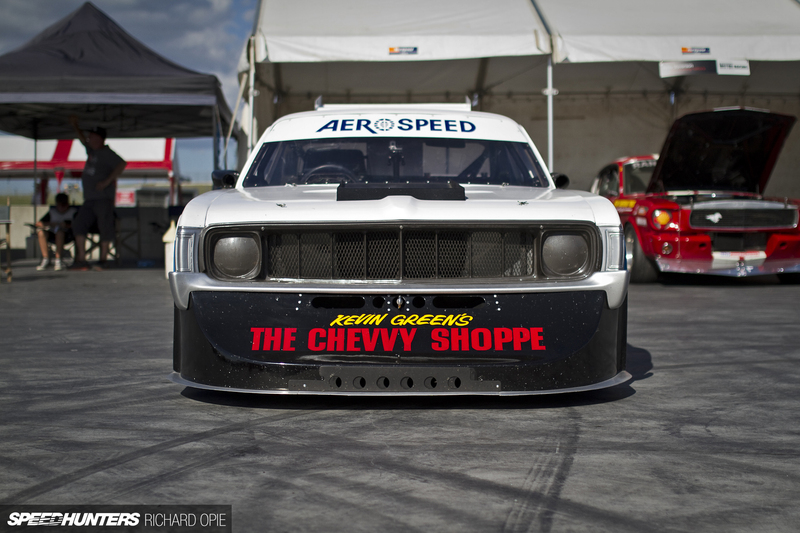 This reminds me of the old Group 5 race cars. NickGalea Simlar train of thought I think, except the McCormack charger had the engine in the usual spot. 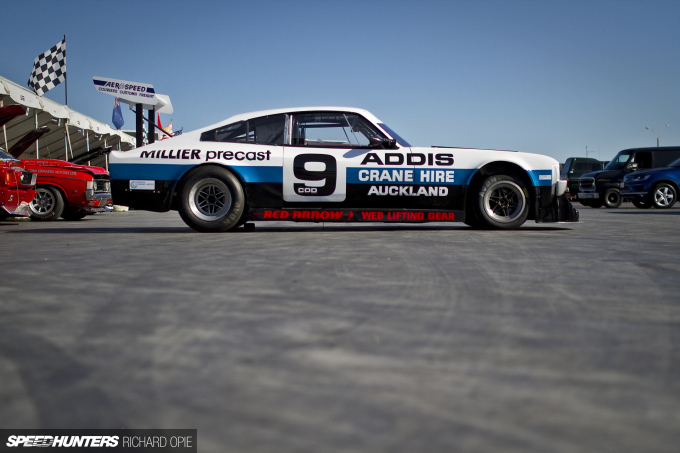 I've always liked that car though, maybe one of the best looking Chargers ever. WTF?! I nearly didn't click on this link and might have missed out on a history lesson. I saw Circuit Outlaw and was interested in clicking on this article and now I'm drooling all over this Charger right now.